Share the post "First-Ever Flower Grown In Outer Space"
When we think of gardening, we usually imagine sun, soil, water or rain, and other Earth things which make plants live. Well, now it turns out, that our plants don’t actually need to be on our planet in order to grow and even bloom. The experiment to grow flowers in space began on November 16, 2015 by the astronauts aboard the International Space Station (ISS). NASA astronaut Kjell Lindgren has started the Veggie system and its rooting “pillows” containing zinnia seeds. It was the challenging task which could help scientists back on Earth to better understand how plants grow in microgravity. Also, it was a good practice for astronauts to learn and try the autonomous gardening, which they will have to do on a deep space mission. By studying how plants grow with very little gravity, scientists are hoping to develop ways for astronauts to grow their own food, at least in part. In late December, Expedition 46 Commander Scott Kelly noticed that the plants “weren’t looking too good”. 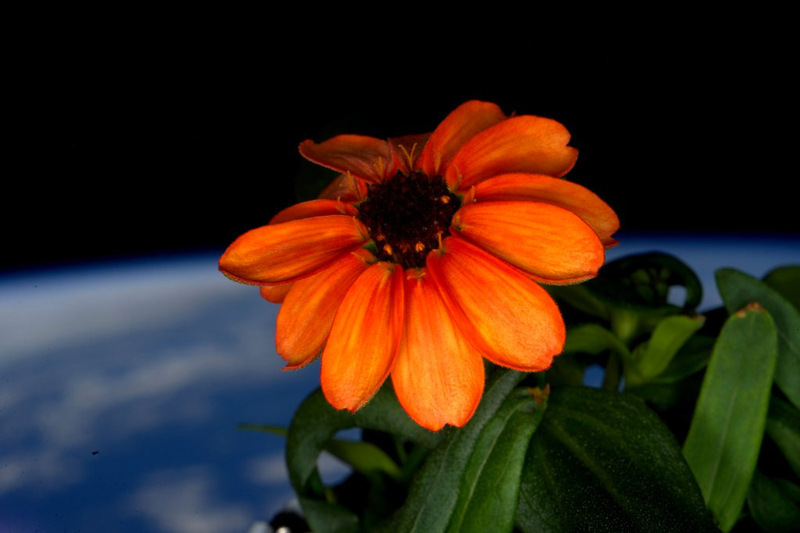 The Veggie team on Earth created “The Zinnia Care Guide for the On-Orbit Gardener,” and gave basic guidelines for care while putting judgment capabilities into the hands of the astronaut who had the plants right in front of him. Soon, the flowers recovered, and on January 16, 2016 the world saw the pictures of the first ever blooming in space flower. “Yes, there are other life forms in space!” Scott Kelly joked on Twitter. While this little zinnia flower might seem humble, it’s a symbol of the amazing advances in science that allow us to explore the stars! Previously, lettuce has aready been grown in the International Space Station’s Veggie facility and eaten by the crew, as the VEG-01 project is meant to explore how astronauts will eventually grow more complex foods like tomatoes.